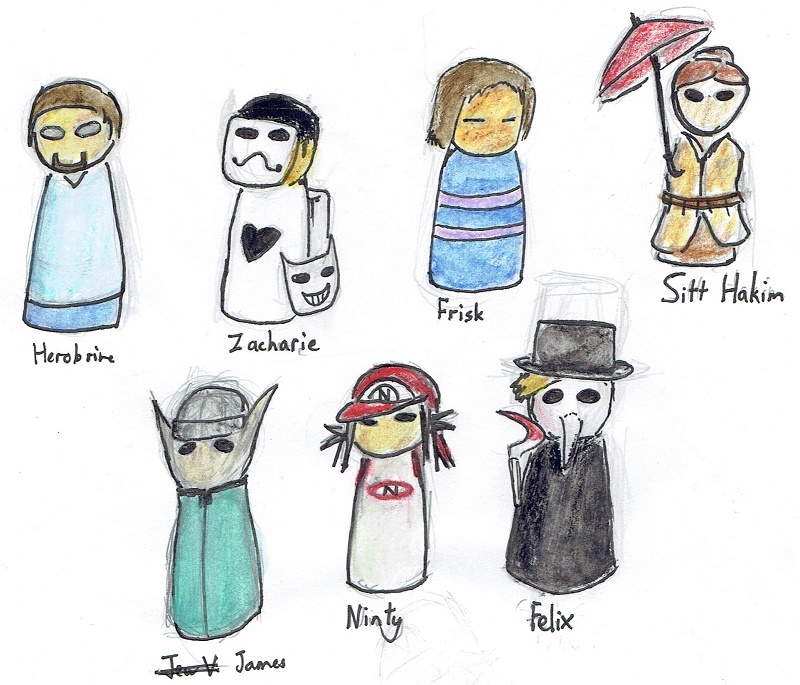 Trad drew up some "Tumblr Dolls"! It looks like he's already starting to cycle into the remorse stage of things. What did he see himself do?? So I just realized there's a chapter setup in this comic, but I have no idea how it works or what the distinction between parts is. daaaaw those tumblr dolls are adorable ...wait.. bloodied sickle .. It's nice Felix is checking up on Benny. Well, at least it whatever it was, it wasn't too bad. That "Tumblr Dolls" thing reminds me of the Fisher Price characters that I had for this castle I had as a kid. I think they're pretty cool. When you see yourself then you probably have some hidden doubts. Hm. Come to think of it, I am not sure these guys EVER sat down and talked. I mean casual friends talk. And they are together for a while now. and the plot advances .. love the page .. the tumbler dolls are cute! Right? Gosh! I wish I'd heard of these sooner, such a cute idea! But yeah Benny-boy, let's redefine what "that bad" means :'D 'cause it's still really bad if you saw yourself skewered!! I don't understand the artstyle in this comic at all. It reminds me way too much of Ctrl Alt Del. I seemed to be missing the joke. People still remember Ctrl Alt Del? 2010 was a long time ago in Internet years. Oh lord, I'm actually short of breath I'm laughing so hard. Felix confirmed part of Mystery Inc. They even went scooby doo and split up! Woah! It all comes full circle! !